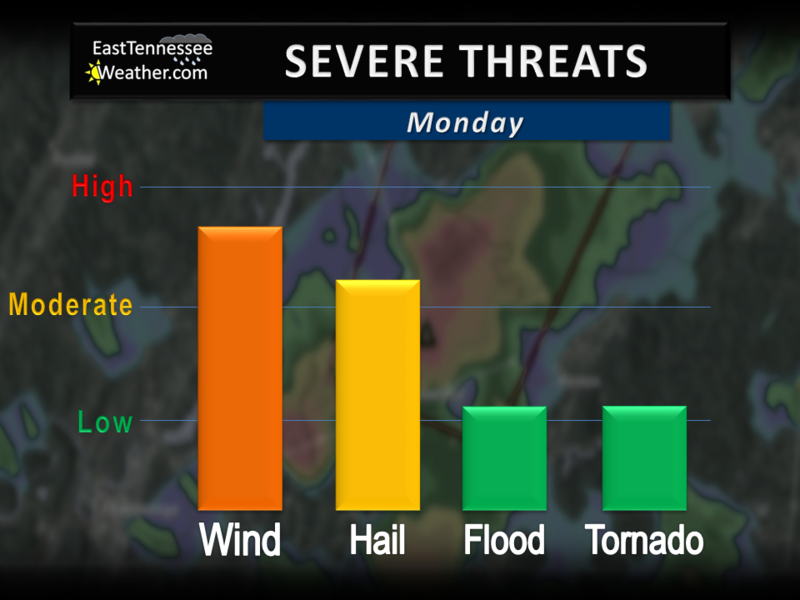 We are monitoring a severe weather threat for today and tonight. Strong to severe thunderstorms are possible from this afternoon to the early morning hours of Saturday. The primary threats include damaging winds in excess of 60 mph and large hail up to an inch in diameter. The tornado threat is very low and tornadic activity is not expected. Round One: Pop-up t-storms may rapidly become strong to severe this afternoon. We’re expecting two rounds of thunderstorms. The first will come this afternoon and evening. These will initiate as typical scattered summertime pop-up storms, but due to enhanced instability, they may rapidly become strong to severe. Round Two: A line of strong to severe t-storms will likely approach the region late tonight. The second round will come after dark, most likely between midnight and daybreak Saturday. A line of strong to severe thunderstorms will approach the region after traveling southeast through Kentucky and Middle and West Tennessee. Although this second wave will be more organized than this afternoon’s pop-up storms, instability will be significantly less than during the day. But, because these storms will likely have a history of being very strong to severe across Kentucky and other parts of Tennessee, it may still pose a threat to our region before it significantly weakens. 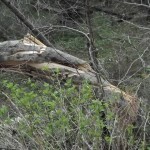 All of East Tennessee is under a threat of severe weather. The Storm Prediction Center has placed most of the region under a “Slight Risk” for severe weather. However, locations north of the I-40 corridor will see the greatest threat, especially those along the TN/KY border and northern Cumberland Plateau. 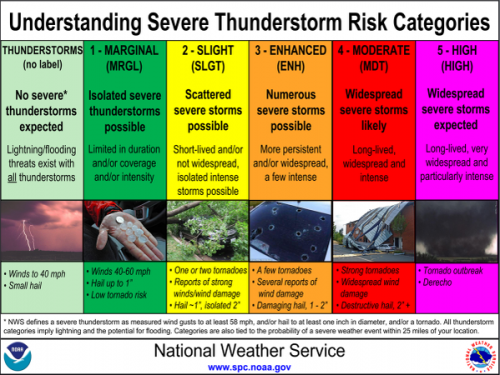 An “Enhanced Risk” is in effect for these locations. 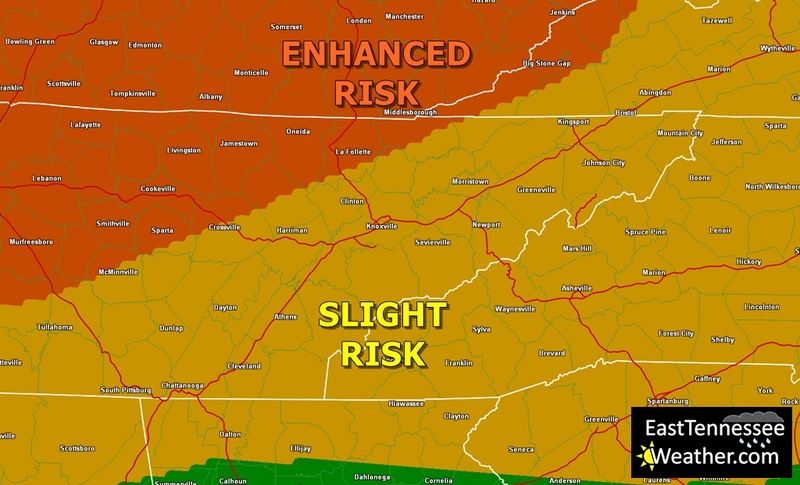 The “Enhanced Risk” also includes most of West and Middle Tennessee and the entire state of Kentucky. Southern portions of Illinois, Indiana, and Ohio are also included. The primary threat from both rounds of storms is damaging winds in excess of 60 mph. Large hail up to golf ball size is also possible. Locally heavy rainfall may cause minor flash flooding for some locations. The tornado threat is very low and tornadic activity is not likely.